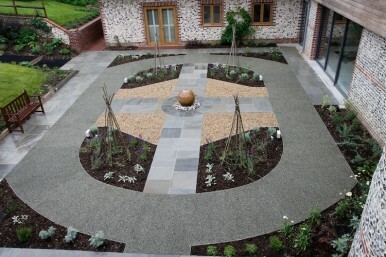 This accessible surfacing project in Hampshire required a rubber crumb, soft fall surface within a landscape with various additional textured elements and focal points of interest. Irrigation, electrics and lighting was installed along with all the hard surfacing and ground works. The courtyard provides an interesting and safe area for study and relaxation. Time and weather constraints were tight on this multi-trade site but our teams managed to install and complete to their usual high standards.